This Maytag french door refrigerator is made with heavy-duty components and features that deliver the right kind of cold exactly where it's needed. 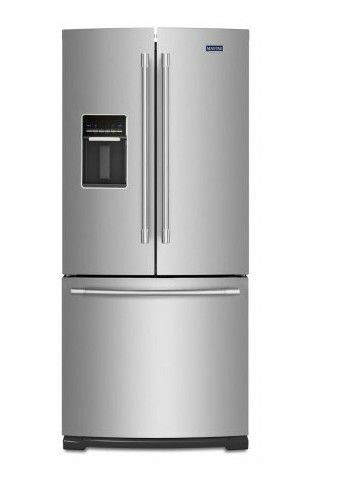 It's available in Fingerprint Resistant Stainless Steel to keep this fridge looking as good on the outside as it works on the inside. The temperature-controlled Wide-N-Fresh deli drawer provides the perfect place to keep deli items so they stay fresh longer. And when it comes to durability, this french door refrigerator has stainless steel handles to give you something hardy to grab on to. Take the work out of keeping your fridge looking good with easy-to-clean, Fingerprint Resistant Stainless Steel finish. This is one refrigerator the whole family can happily get their hands on. The FreshFlow produce preserver helps keep your fruit and vegetables fresh longer.